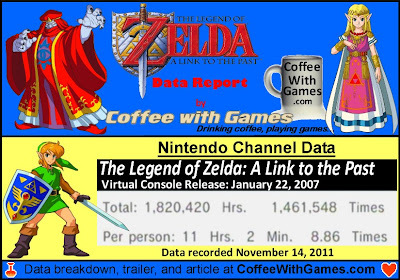 The Legend of Zelda: A Link to the Past has 164,960 Wii owners that have reported game-play data through the Nintendo Channel, just in the United States. The game's average play-time per day/session reported is 1 Hour 14 Minutes. The Legend of Zelda: A Link to the Past's United States release has made Nintendo about $1,319,680, just based on the number of Wii owners that have reported data and the game's $8.00 price point, since it was released. Have I played the game? 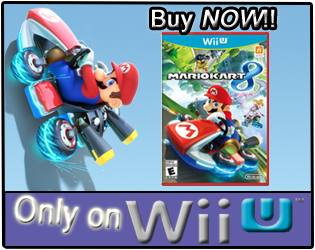 Well, we own this one on our Wii, but I can't remember playing it since the 90s, and I don't even remember beating it. Now you may be thinking, "Coffee, how do you own it on the Wii, but you haven't played it?" She hasn't finished the game and hasn't played it in a while, but she picks it up every once in a while. Seeing The Legend of Zelda: A Link to the Past with more than a 10 hour average "Per person" reporting data I think is really great for the game, and I think that average play-time, along with seeing how well received this game was, shows it is definitely worth the $8.00 price. Box art for the SNES version. Have any of you played through The Legend of Zelda: A Link to the Past recently, perhaps playing even the original SNES version or Game Boy Advance version? If you are a fan of the Zelda series and have played many of the games, where would you rank The Legend of Zelda: A Link to the Past compared to the other titles? Sorry for the late response. It kinda depends on if you know what you are doing and just play through it in one sitting or if you just explore the world going for all the heart pieces and items. Speeding through the game it can take as few as 3 hours or less. If it is your first time through the game it can take a bit more time depending on if the puzzles get in your way. I will admit when I had this on the SNES it took a while to get through some of the dungeons like the Ice and the Forest dungeons in the dark world. It took me a few months back then to beat it fully back then. It varies really. I have played Link to the Past multiple times, but never actually finished it. I personally prefer Links Awakening of the 2D Zeldas, and Ocarina of Time over them all. I've grown very distant to Zelda over the years, and I'm not entirely sure why. I know I don't like the modern ones because to me it's a series that has become formulaic in a bad way, but I haven't been able to go back and replay any either. Even the 3DS remake I've only logged 4 hours in. I will admit ... have not played this one. Loved the first two zelda games, and haven't played through one since. Not entirely sure why, really. I've always meant to, just haven't returned to the series. I love these games. Only one on the console I haven't beaten is II. Its so hard. Some of my fondest gaming moments are from this series. Just figuring things out without guides. My fondest memory was in my high school years, playing Link to the Past. I was wandering around the 6th dungeon for hours, when a few friends popped by out of the blue. He saw where I was and instantly knew what I needed to do. It BLEW my mind. Then we plowed through the game together. Can anyone guess what the hint he gave me was? I've played all three versions of A Link to the Past (SNES, GBA, Wii VC), and it remains my second favorite Zelda of all time. "I have played Link to the Past multiple times, but never actually finished it." As for growing distant, I can't say I have been a huge fan where I must go out and get the new games day one, as I haven't even purchased Skyward Sword; but I did enjoy my time with Twilight Princess, and I put probably 10-ish hours into Wind Waker before stopping that one. So, did you not play the GameCube, N64, and/or Wii Zelda games? I think I remember you saying your son played Twilight Princess, but you never beat it? Nice memory of the Link to the Past there. Sadly, I can't even tell you what the 6th dungeon is(doesn't know how many dungeons the game has). Nice. Do you, or anybody else, know if A Link to th Past is one of the 3DS games Nintendo is releasing on the digital service? Thank you all for the comments/feedback. Can anybody answer Chuck Pebble's question about the hint he received from his friend in the 6th dungeon? Nintendo expressed an interest in making it a 3D game, but that was just an expression and nothing at all concrete. @ Chuck Pebble. I take it you mean the ice dungeon in the dark world. All the dungeons in the dark world can be played out of order. @ topic. This is my favorite game of all time. I played the SNES and Wii VC versions. In fact this was my first VC game I bought. I'll be interested to see if your answer to his question is right! Being that this is your favorite game, can you verify that it takes about 11 hours to complete the game? Thanks for the comment/feedback, I appreciate it! As before zero experience with the game, but from everything I've read and seen it may end up being my favorite. I really dig the music and this kind of overhead 2D Zelda experience. Playing the LTTP-inspired stage in Zelda Four Swords (realm of memories) on the 3DS has been a blast even if it's just a small snippet. Just going to bite the bullet when I have my Wii back and get it on VC regardless of the incomplete backlog. 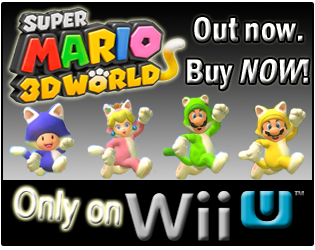 Though I may be tempted to get it on 3DS first if that were an option. As for other Zelda's I liked 1 and 2 and OOT 3D has also been fun, just in a different way. @Coffee: haha, my incompleteness is spreading! @coffee - correct. The gamecube got a lot less use from me than it did my kids. I had that and a PS2 at the same time, and I played the PS2 so much more that the cube wound up in the kids' living room where I almost never play it. Correct on Twilight as well - he played it for the cube, and eventually it got scratched up and quit working, so I had just never gotten around to it. Nice. Do you, or anybody else, know if A Link to the Past is one of the 3DS games Nintendo is releasing on the digital service?